Earn rewards that allow you to spend where your business needs it most such as office supply stores, gas stations, and restaurants - with no annual fee. Contact a Business Banker or visit a local banking center to get started. Our small business credit card helps you strike the perfect balance between growing your business and maintaining an optimal level of working capital. Take advantage of vendor early payment terms without negatively impacting your current cash flow. Pay your vendors with a small business credit card and extend your accounts payable cycle without incurring interest expense when you pay your balance in full. Access your small business credit card account information easily and securely online at no cost to you. At gotomycard.com, you can securely view your card account summary, including the balance, credit line, payment due, and more. Card Management also allows you to view current and historical transaction activity, view up to 24-months of eStatements, download account data into Quicken® or Microsoft Money® accounting software, make payments, initiate card disputes, and receive alerts on balance transaction and payment events. This service provides enrolled cardholders automatic discounts on qualifying purchases at participating merchants. Discounts require no coupons or codes. Qualifying purchases at participating merchants earn credits that are applied directly to your card statement. Includes the Visa SavingsEdge® mobile app to find savings near you. Learn more at VisaSavingsEdge.com. Our Business Solutions Money Market Savings account is for established businesses looking to maximize earnings or save for a future large purchase. 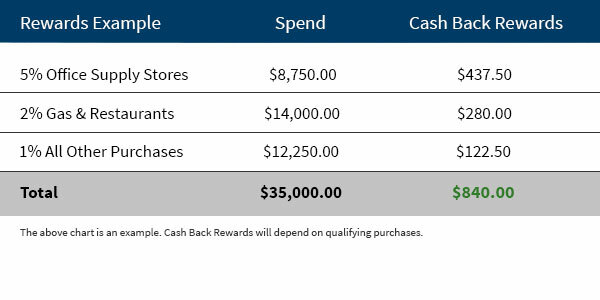 2Cash Back Rewards are the rewards earned under the program. They are tracked as points and for each $1 spent on a purchase, 1 Cash Back Reward point is earned, which qualifies for $0.01 for redemption. You earn Cash Back Rewards on all qualifying purchases. The following do not earn points: balance transfers, cash advances, convenience checks, fees, interest or payments. You may review the full Terms and Conditions of the Cash Back Rewards program here: savvy-rewards.com.